These 8th graders are styling! 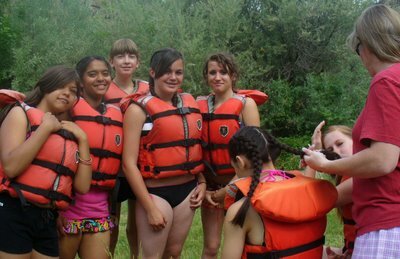 The Dunsmuir Elementary 8th grade graduates celebrated the end of the school year and their graduation by floating down the Klamath River last June. By choosing an adventure close to home and by spending their bucks locally they proved to be smart shoppers and savvy consumers. Rope making in the wilderness. Aaron, on hiatus from his career as an electrical engineer, is an accomplished river guide and mountaineer and a very resourceful outdoorsman. Here he is demonstrating rope making using some milkweed that grows in great abundance along the river corridor.